A little over two weeks ago we sat down with our families on Thanksgiving and enjoyed two things; a delicious turkey dinner and a Seahawks win over the San Francisco 49ers. On Sunday, with just under two weeks until Christmas, the Seahawks and 49ers square off for the second time in a three-game span, this time however at the friendly confines of CenturyLink Field. When the schedule came out many thought that this game could determine who wins the NFC West. Instead the Seahawks currently sit at 9-4 and are still alive for the division title. The 49ers are 7-6 and a loss to the Seahawks this week will all but mathematically eliminate them from playoff contention. Since we played San Francisco only a handful of days ago, nothing should be new from a game-planning perspective. Nevertheless, here are some brief points of emphasis I will be watching for in this game. 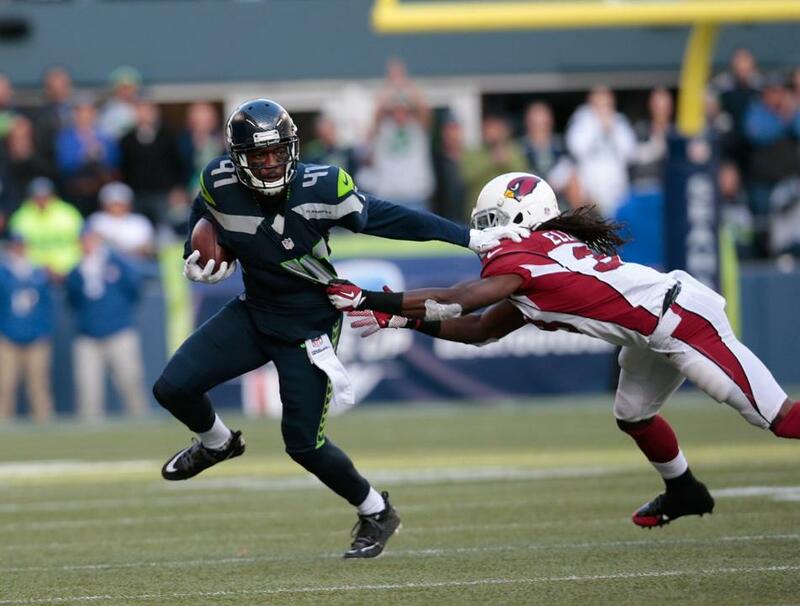 Two weeks ago in Santa Clara the Seahawks racked up 157 total rushing yards, 104 of them coming from Marshawn Lynch. This week I am confident that a 100 yard day from Lynch will all but assure a Seahawks win. This week I am looking to see how involved Robert Turbin and Russell Wilson will be on the ground. I do not expect to see Wilson scramble as often as he has the past couple of weeks. A steady mix of Lynch and Turbin will be the Seahawks go-to on early downs this week. In the passing game it would not be a surprise to see Russell Wilson throw deep early in the game to test the San Francisco secondary. That may be it for the deep ball however, as I think short passes and controlling the clock may be Seattle’s strategy after holding the ball for nearly 42 minutes last week. Most importantly I do not want to see the Seahawks try to get fancy on offense. We played a solid offensive game in San Francisco two weeks ago and it was effective. There is no reason to fix something that is not broken for this game. On the defensive side of the ball I am curious to see how the first San Francisco offensive possession plays out. 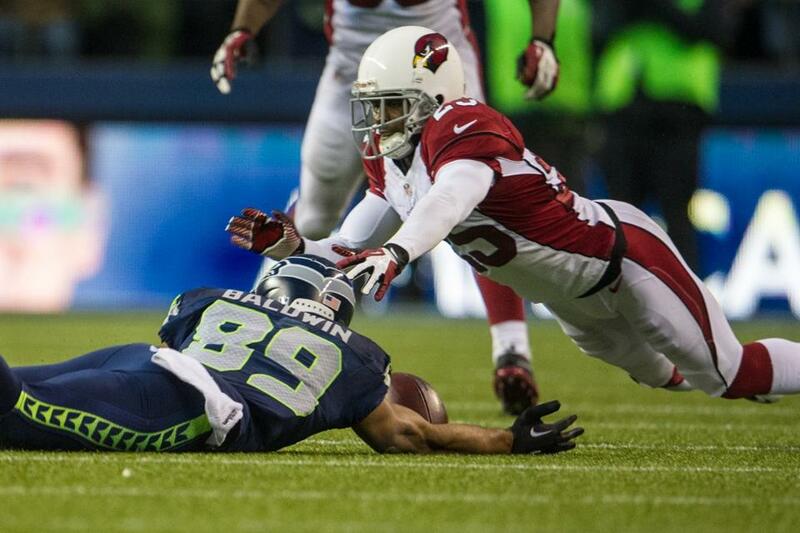 I believe how the Seahawks defense plays on that first series will determine how the rest of the game will play out. Simply put there are three different scenarios I could see playing out. If the Seahawks can stop San Francisco for a three-and-out, this game could get ugly very quickly in favor of Seattle. If the 49ers can drive down the field but fail to put points on the board, they may be able to keep it close for the first part of the game. If the 49ers can put together a successful first drive that results in points, this could be a close game throughout. It will be up to the enforcers at each level of our defense to make sure that the 49ers come away empty handed. I am looking at Cliff Avril, Bobby Wagner, and Kam Chancellor to have monster games making tackles. I would also not be surprised to see Richard Sherman and Byron Maxwell make an impact forcing turnovers as well. In our last game against the 49ers I put a focus on the San Francisco defense. This week I am choosing to focus on the offensive side of the ball. In his last 5 games played in Seattle, 49ers running back Frank Gore has averaged only 36 rushing yards per game. He has not run for more than 30 yards at CenturyLink Field since 2011. It is because of these numbers that I am not worried about Gore. If our game two weeks ago is any indication, I am also not worried about the arm of San Francisco quarterback Colin Kaepernick. The only way I can see the 49ers putting points on the board is on the legs of Kaepernick. For the second straight week I put my X-Factor focus on the opposing quarterback; Colin Kaepernick is my X-Factor player to watch for San Francisco. In the NFC Championship game last January, Kaepernick put the game in his own hands as he ran for 130 yards. This season we have not seen much of Kaepernick on the ground, as he has been more patient behind the line of scrimmage. His three most productive games running the ball all came way back in September. This week the 49ers will be in trouble if Kaepernick tries to stay in the pocket and read his progressions. If I were 49ers offensive coordinator Greg Roman, I would give Kaepernick the green light to take off if he does not like his first read. A solid day on the ground for #7 is the only way I see the 49ers staying competitive in this game. 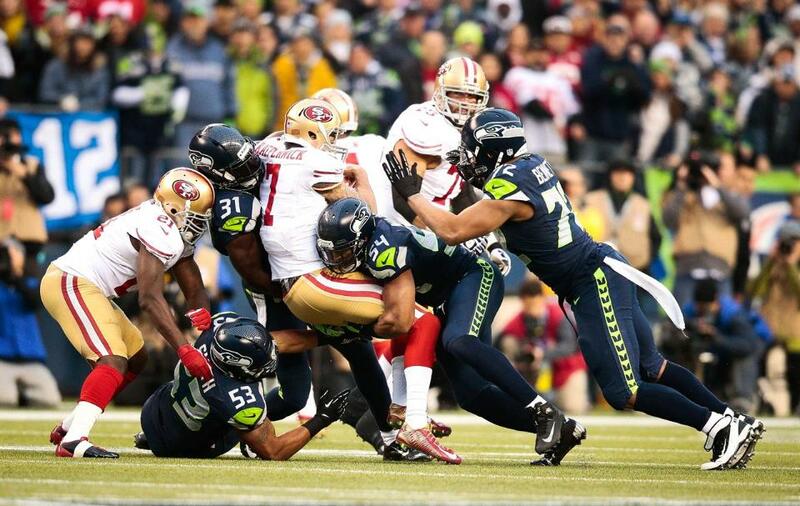 One other thing that cannot happen this week is for the Seahawks to overlook this 49ers team. I know the Seahawks can and should win this game but the worst thing that could happen is to get overconfident and play as if a win is a guarantee. We are smarter than that. I will be a bit worried and angry if we play cocky, at least to start off when the game is close. Wrap this win up, then move on to next week’s game against the Cardinals. Random Thoughts: I guarantee that I will not mess up the uniform combinations for either team this week. The Seahawks will go with their navy/navy home look. The 49ers will wear their classic look pairing white jerseys with gold pants… For the second straight week the Seahawks are featured as “America’s Game of the Week” on FOX. Joe Buck, Troy Aikman, and Erin Andrews have the call once again… Ed Hochuli will officiate his second Seahawks game of 2014 this week. Ed previously called the Seahawks week 9 win over the Oakland Raiders… I love going to late season home games when it is supposed to be sunny. They’re calling for partly cloudy with temperatures in the high 40’s. Should be plenty comfortable… A reminder to everyone going to the game that kickoff is scheduled for 1:25pm. Allow yourselves enough time to get inside the stadium by kickoff… The giveaway this week is ribbons raising Ebola awareness. I understand that this Ebola is a serious matter but couldn’t the Seahawks have figured out a different (better) giveaway? There have been almost no good giveaways at the gates this season. That is pretty disappointing… The halftime show this week is high school marching bands featuring my old high school, Newport High School. Here’s a funny story. 9 years ago I participated in a Seahawks halftime show with the Newport marching band. We were all given blue Seahawks wristbands which my friends and I later learned gave us access to all parts of the stadium. After we performed at halftime we snuck into the game and watched about 5 minutes of the 3rd quarter from the club level. We were then tattled on when we caught up with the band (after we found out they were leaving without us). We failed the “assignment” and I would up with an A- in band that quarter. Would I do it again? Absolutely. It was totally worth it in my opinion. It is kind of sad to think this is likely the final Seahawks game against the 49ers with Jim Harbaugh as their head coach. As much as the 12th Man hates Harbaugh, I will kind of miss him for the sole reason that this potentially marks the beginning of the end of our rivalry with the San Francisco 49ers, which has been quality entertainment for the past 4 seasons. Seahawks Playoff Outlook: The Seahawks are 9-4 and with the Arizona Cardinals win over the St. Louis Rams on Thursday we are currently 1 ½ games behind Arizona for the division lead. A Seahawks win will get us back to within one game of the division lead however we will be locked into the #5 seed for at least another week. Although a win would give us 10 on the season, we cannot clinch a playoff berth after this week. A Green Bay Packers loss to the Buffalo Bills can clear the final road block for the Seahawks to claim home field advantage (if Seattle wins out). Here are this week’s other games with NFC playoff implications. Teams to note are bolded. Prediction: Let me be frank. The Seahawks will dominate this game in all phases from start to finish. The Seahawks will take a comfortable 17-3 lead into halftime and the pick barrage will begin in the second half. Colin Kaepernick will throw 4 interceptions, 3 coming in the second half. Byron Maxwell will have two of those interceptions. Richard Sherman and Tharold Simon will add the other two. The Seahawks will improve to 10-4 and will get ready for easily their biggest game of the season in Arizona next week. Check back late Sunday night/early Monday morning for my 49ers game review. Go Seahawks! Perhaps I need to have a little more faith in this team. After a morning and afternoon full of worry and anxiety the Seahawks made sure they turned Thanksgiving into Hawksgiving, thumping the San Francisco 49ers 19-3. In my mind this is the most complete game the Seahawks have played all season long and it is extremely encouraging to see this team start to click at the most important point in the season. The Seahawks improve to 8-4, strengthening their chances at a playoff berth while also keeping their chances at the NFC West title intact. The 49ers fall to 7-5 and are in serious jeopardy of missing out on the playoffs altogether. There is so much good to talk about so let me get right into it. Seahawks Find a Way to Move the Ball: Tonight the Seahawks found several different ways to move the ball thanks in large part to the pass protection of quarterback Russell Wilson by our offensive line. Screen passes and runs off-tackle made up a lot of our offensive yards and it seemed like the 49ers defense did not have an answer for making tackles in the open field. The running game got off to a slow start but the Seahawks were able to adjust throughout the game and Marshawn Lynch had more success later on in the game. The only knock I have on our offense was that it seemed as though we were allergic to the redzone, whether it was due to penalties or because of plays accruing negative yards. It seemed like whenever the Seahawks got into field goal range they stayed in field goal range. It would have been nice to see the Seahawks turn a couple of their 4 field goals into touchdowns. 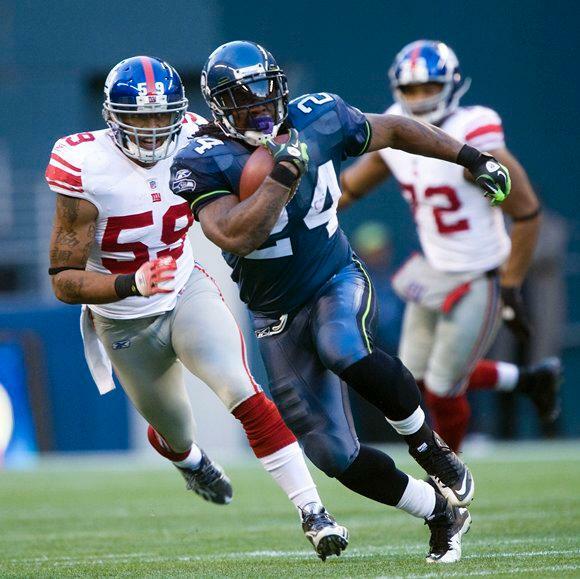 Unsung Hero: Marshawn Lynch found a way to run for 104 yards on 20 carries but the play of Robert Turbin really impressed me in this game. While Lynch took care of business on the ground the presence of Turbin in the passing game made a significant difference. Turbin scored the only touchdown of the game, a 13-yard pass from Russell Wilson which gave the Seahawks a 7-0 lead in the first quarter. He also added a 34-yard catch later on in the first half. When the dust settled Turbin was the Seahawks second leading receiver on the night. I would like to see Turbin in an expanded role as we move forward. The threat of him catching passes out of the backfield could be a good decoy to use in the coming weeks. General Thoughts on Seahawks Defense: The Seahawks defense simply played their best game of the season. All aspects of the unit played quality football this week. The front seven contained San Francisco running back Frank Gore to only 28 yards on 10 carries. The linebackers helped hold the 49ers to only a 36 percent third down conversion rate. Kam Chancellor made several punishing hits on 49ers receivers and Richard Sherman and Byron Maxwell combined only allowed one pass to be completed on them. All this is fantastic but above all else I am mostly satisfied with the pass rush that FINALLY put continuous pressure on the opposing quarterback. The Seahawks defense totaled 4 sacks this week and defensive end Cliff Avril added a pair of quarterback hits. Seattle’s defense accomplished everything it wanted to in this game and I am convinced that the complete unit which was missing for the majority of the season is finally back. How Fitting: It had been 10 months since the Seahawks beat the 49ers in the NFC Championship. It had been 10 months since Richard Sherman called out San Francisco receiver Michael Crabtree during the postgame celebration. In the months that followed Sherman solidified his place as arguably the most hated player in the National Football League. How fitting is it that in the first game between these two teams since January that Sherman has his best game of the season. Sherman made his presence known on the field on Thursday and he made the most of his opportunities, as he played a near-perfect game. Sherman did not allow a catch and he also intercepted 2 Colin Kaepernick passes. Given the history between Sherman and the 49ers, I could not help but love his post-play antics which included blowing kisses to the crowd and partaking in eating turkey postgame on the 49ers logo alongside fellow co-player of the game Russell Wilson. Sherman finishes the month of November with 3 picks. Let’s see if he can keep that momentum going into December. Penalties Still Problematic: After Sunday’s win over Arizona head coach Pete Carroll called out the team by saying he “has had it up to here” with the number of penalties we commit and the amount of penalty yardage we continue to give up on a week to week basis. This week our penalty problems continued. On Thursday night the Seahawks committed 14 penalties totaling 105 yards while the 49ers only committed 3 penalties for 20 yards. Many of Seattle’s penalties were procedure penalties that should be easily corrected yet continue to give us trouble. Fortunately those kinds of penalties did not result in a fresh set of downs for the 49ers offense but we could have been worse off if they had resulted in San Francisco first downs. The Seahawks have 10 days to make the necessary changes to make sure we are not as penalized when we play Philadelphia. Thoughts on San Francisco: This San Francisco 49ers team has completely lost its identity. The defense looked average at best while the offense looked terrible. Following their win last week head coach Jim Harbaugh called Colin Kaepernick a “great quarterback with a capital G.” Tonight however he looked more like “garbage with a capital G.” The 49ers essentially need to win the rest of their games to even have a chance at making the playoffs and the way they played this week leads me to believe that will not happen. To make things worse, people are already talking about Harbaugh not even lasting through the end of this season. This team has talent but they are a mess on both sides of the ball. We have 18 days until we play them again in Seattle but from where I am sitting right now I believe that this team is in definite need of a culture change. Random Thoughts: The Seahawks did in fact go with wolf grey for this game. That means we will white for our remaining road games in Philadelphia and Arizona. With the win the Seahawks are now 5-0 all-time in wolf grey… I thought the “Beat the Seahawks” banner that the 49ers fans held up at the opening kickoff was funny… The 49ers have failed to establish any kind of home field advantage at Levi’s Stadium. That is pretty sad. I have heard that Levi’s is nothing like Candlestick Park. What I mean by that is that their new stadium is very corporate and more fit for the affluent residents of the south bay. The 49ers lost their swagger as soon as they left Candlestick. Hopefully I get to give Santa Clara a visit for next year’s game… Here’s a fun drinking game idea. Every time Cris Collinsworth says something like “this is going to be a physical game” or “these teams like to brawl,” take a shot. Collinsworth’s commentary was annoying me pretty bad as the game wore on… Seeing Wilson and Sherman stuff their faces with turkey after the game is one of the greatest images I’ve seen in a long time. What made it better was that Sherman complained that NBC provided no spices for the turkey and Wilson complained that there was no macaroni and cheese on the table… If we win next week do you think we run the table? I am starting to think it is a definite possibility… These Sunday games are going to be so much sweeter knowing we have already won our game for the week. Check back next week as I preview the Seahawks week 14 game against the Philadelphia Eagles. I hope everyone had a great Thanksgiving. I want to thank you for the continuous support of this blog. It means a lot. Go Seahawks! After finishing the first half of the regular season at 5-3 the Seahawks open up the second half of the season at home this week against the New York Giants. The Seahawks, with their 5-3 record, currently sit in second place in the NFC West while the Giants stumble into CenturyLink Field this week. The Giants are 3-5 and are coming off a brutal 40-24 blowout loss to the Indianapolis Colts at home. To make matters worse, they played the Colts last Monday night which means they will play this game on a short week. New York leads the all-time series with the Seahawks 9-7 but the Seahawks have most of the recent success, beating the Giants 23-0 at the Meadowlands last season. The Seahawks have also won 2 of the last 3 meetings played at CenturyLink Field, including the famous 2005 matchup won by the Seahawks (more on this later). We cannot afford to let this game slip away. Here is what I will be focusing on this week. This week on both sides of the ball my primary focus is how we can improve our play with key players returning from injury. On offense I am looking for Marshawn Lynch to carry over his success from last week on the ground and I am looking for Russell Wilson to make clean throws from inside the pocket, thanks to the return of center Max Unger. Unger has not played since week 5 against Washington when he injured his foot late in that game. In the 4 games Unger missed, the Seahawks have averaged 326 yards of offense per game and Lynch has only run for an average of 61 yards per game. Lynch has not had a 100 yard rushing game since week 1. This week could be the week Lynch tops that plateau once more as the Giants allow an average of 119 rushing yards per game. This week do not be surprised to see Wilson throw Jermaine Kearse’s way a lot. With Doug Baldwin nursing a groin injury that may or may not limit his physical ability, Kearse may be the receiver Wilson is most comfortable with. After rookies Paul Richardson and Kevin Norwood combined for only 31 receiving yards last week, I believe that Wilson’s comfort level with these guys is not where they would like it to be just yet. 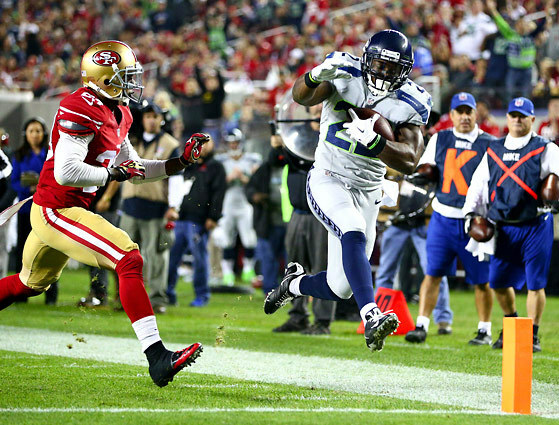 I would not be surprised if Kearse is Seattle’s leading receiver this week. Although linebacker Bobby Wagner has been ruled out, the Legion of Boom may be back at full strength this week. Safety Kam Chancellor and cornerback Byron Maxwell have both been participants in practice this week and will likely play. The LOB is my primary focus on defense this week, considering the success they had forcing 5 Eli Manning interceptions in their matchup last season. After intercepting his first pass of the season last week I believe Richard Sherman is a guy to watch and it will be interesting to see if Manning is willing to test Sherman or if he will try to avoid him for the majority of the game. The front seven must put pressure on Manning to take pressure off of the Seattle secondary. Bruce Irvin has stepped up in recent weeks and I hope to see him step up again in this game. Also keep an eye on Brock Coyle and K.J. Wright. Wright stepped up big to help Coyle out last week, recording 13 tackles however more should be expected of Coyle this week in the middle of the field. The New York Giants are kind of a mystery to me on offense. Eli Manning has shown that he can be a great quarterback but they have not played at a high level consistently the past couple of seasons. Plain and simple, this is not the same Giants team that won the Super Bowl a mere three seasons ago. In a hostile environment, I believe that New York must establish the running game to have any success on offense. My focus this week however is on the Giants defense. Gone are the days of a strong veteran pass rush anchored by Justin Tuck and Osi Umenyiora. Instead the Giants have gotten younger and they have shown to have very good talent. The only problem is that like the Seahawks, the Giants have been depleted by a rash of injuries. Certain players have been thrust into starting roles that they were nowhere near close to holding at the beginning of the season. My X-Factor player to watch for the Giants this week is one of those kinds of players, cornerback Jayron Hosley. Hosley has found himself starting at cornerback this week after Prince Amukamara was placed on injured reserve after suffering a season-ending biceps tear on Monday night. Hosley began the season on New York’s practice squad and he was suspended for the Giants first 4 games for violating the NFL’s drug policy. 3 of Hosley’s 4 tackles this season came after replacing Amukamara against Indianapolis and he also added a pass defensed against the Colts. Given the uncertainty of the Seahawks wide receiver situation this week, Hosley will likely line up on both sides of the field. Hosley vs. Jermaine Kearse will be an interesting matchup to watch given the height advantage Kearse will have. Keep an eye out this week for how the Seahawks attack Jayron Hosley and if he can step up to prevent the Seahawks from moving the ball in large chunks. There is one last thing to watch this week and hopefully true Seahawks fans already know what I am talking about given that the Giants are in town. In 2005 the 12th Man helped force the Giants into 11 false start penalties. The Seahawks went on to win that game in overtime and I believe that game was the unofficial start of what has become the most intimidating fan base in all of sports. Even in the 2 Giants/Seahawks games played in Seattle since, Eli Manning and the Giants have continued to struggle handling the crowd noise and I am confident this week will be no different. The Seahawks will definitely do their part to remind the fans in attendance on Sunday what has happened in past meetings and it will fuel the 12’s to be as loud as possible. Crowd noise may be a bigger factor this week than in any other Seahawks game so far this season. Random Thoughts: The Seahawks will wear all-navy once again this week. The Giants will wear white jerseys and gray pants. I find it funny yet interesting that the Giants (nicknamed Big Blue by the way) feature so much red on their away uniforms… Joe Buck and Troy Aikman have the call for FOX this week with Erin Andrews reporting from the sidelines… Pete Morelli is the referee this week… This week is the Seahawks salute to service military appreciation game. Both teams will wear camouflage accessories and the national anthem will likely feature a field-sized American flag. In past years stadiums have also done a red, white, and blue card stunt during the national anthem but that will not happen this year. I bring this up because this is the only game where the 12th Man flag raiser is revealed in the days leading up to the game. This week’s flag raiser is Major Scott Smiley and according to seahawks.com Smiley is “the U.S. Army’s first blind active duty officer”… Having two consecutive home games is the best. It always has, and always will be… Go Saints, Go Rams. Prediction: I believe the score will be close but it will feel like the Seahawks run away with this game. Marshawn Lynch will run for 80 yards while Russell Wilson puts up 275 yards and two touchdowns through the air. Eli Manning will throw a touchdown and a pair of interceptions with the Giants offense racking up 3 false start penalties as well. The Seahawks will win this game and go to 6-3 on the season.